It’s that time of year again and once again we are buying-back children’s Halloween candy. 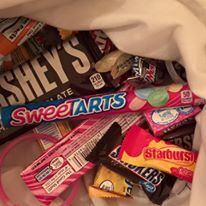 November 1st-10th we will be buying back candy at $1 per pound up to five pounds. In addition, each child who sells us their candy will be entered into a drawing for a Sonicare for Kids toothbrush. So, please, sell us your candy! All of the collected goodies, along with toothbrushes, will be going to CarePacks in Weymouth (www.Carepacks.org) a local organization that sends care packages (not just candy) to U.S. troops overseas.